Peter Miller is one of the most committed clients with whom I’ve had the pleasure of working. 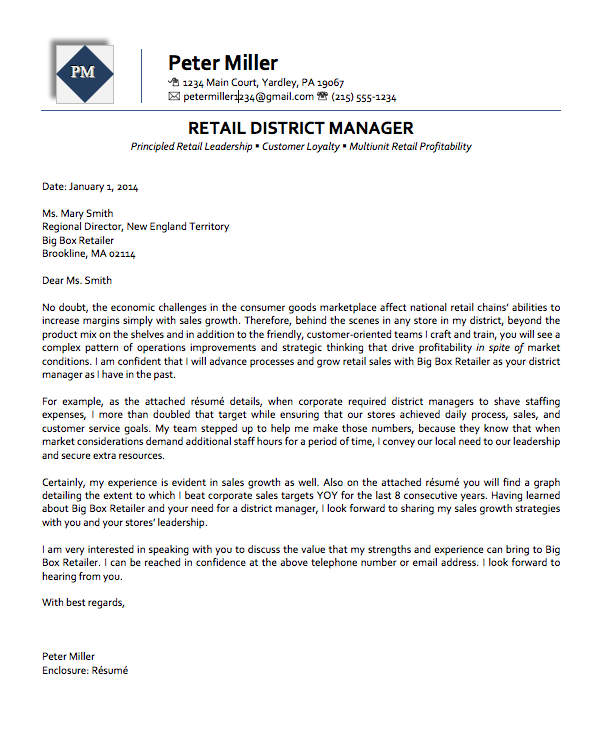 He’s smart, directed, and committed to retail leadership excellence. His cover letter strategy parallels that of his résumé. By highlighting his key accomplishments in narrative form, he is coaxing his reader to find the corroborating sections of his résumé while detailing the best of his expertise. As his résumé writer, I wanted the hiring executive to understand his talent, his commitment to his organization, and his undeniable willingness to back his team in any market condition. The body of this letter is fewer than 300 words. In an era in which so many cover letters, and résumés, are read on smartphones, we as résumé writers need to create content that is readable on the smallest of screens. By using narrative only, without bullet points, we ensure that the text will be scrollable on a phone. Peter’s story is remarkable; he initially wanted to leave his industry. However, he realized as part of his career coaching process that it wasn’t his industry he needed to leave—he just needed to be working for a company that aligned better with his values. Within less than a month of completing his coaching program, which included development of his résumé, cover letter, and LinkedIn profile, he chose a terrific company’s offer from among a few competing options. Want to take your career to the next level? Contact Five Strengths to get started today.